Archbishop Desmond Tutu and former Czech President Vaclav Havel have called on China to release dissident Liu Xiaobo before he is awarded the Nobel Peace Prize on Friday. The pair said Mr Liu was "sadly emblematic of the Chinese government's intolerance". They said China risked losing its credibility as a world leader if it continued to restrict human rights. China says Mr Liu, a democracy activist, is a criminal. Writing in the British newspaper the Observer, the South African archbishop, himself a Nobel Peace Prize laureate, and Mr Havel said: "Though he is just one of 1.3 billion, the story of this year's Nobel peace prize laureate, Dr Liu Xiaobo, is sadly emblematic of the Chinese government's intolerance to individual expression." They praised China's economic development in recent years, but said its "support for abusive regimes and the brutal force with which it crushes dissent within its own borders demonstrates that substantial reform is needed if China is to be viewed within the international community as a true leader". They also accused China of violating the rights of citizens in other countries, saying it "coddles and supports brutal dictatorships around the world". While Beijing has been increasingly eager to assert itself as a global player, its "extreme sensitivity" to any criticism of its policies showed a lack of confidence at home, they said. "This lack of confidence ultimately only serves to further undermine the credibility of the government among its people." Mr Liu - a veteran of the 1989 Tiananmen Square protests - is currently serving an 11-year prison sentence for "subverting state power" for co-authoring a manifesto, called Charter 08, calling for political change in China. His wife, Liu Xia, is effectively under house arrest in Beijing. It is unclear whether the $1.4m (£900,000) award will be handed over at the ceremony, as it can only be given to a close family members, none of whom appear able to attend. China reacted furiously to the Nobel Prize committee's decision in October to award him the prize. Beijing said it was "a complete violation of the principles of the prize and an insult to the peace prize" and would damage ties with Norway. It has urged ambassadors from other countries to boycott Friday's ceremony in Oslo. Archbishop Tutu and Mr Havel said China now had "the unique opportunity to chart a new course" as a world leader, embracing its obligations to promote and protect human rights. 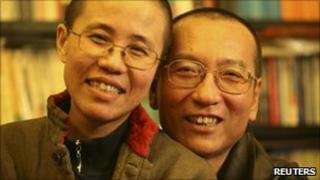 "The first step must be the unconditional release of Liu Xiaobo and his wife, Liu Xia, before the Nobel peace prize award ceremony on Friday."